Could This Pristine 1985 Ford Bronco II Be Worth $13,700? The seller of today's Nice Price or Crack Pipe Bronco II claims its a collector car. Now, that's totally true of its older, less II-ier brothers, but has yet to be seen with these trucks. This one seems extraordinarily nice however, and maybe that will be enough for it to collect its asking. The seller of yesterday's custom 1993 Geo Metro 'roadster' didn't have a wing and a prayer. Well, actually the Metro did have a wing, and that was one of the major contributors to its landslide 89% Crack Pipe loss. Could This Custom 1993 Geo Metro Convertible Drum Up $4,000? That Metro's problem was that its modifications were of questionable taste. Perhaps worse, the car itself was even more questionable. Not seeking to repeat those issues, let's today go with a seemingly untainted ride, and a little horsing around. From a distance, today's 1985 Ford Bronco looks like it just rolled of the assembly line. Get a little closer and you can see evidence that it really rolled out about 61K ago. There's some wear here and there - a little sagging in the driver's seat and a wonky front bumper being most obvious - but overall it's a pretty remarkable example of Ford's Ranger-based sport ute. This one's also an XLT Eddie Bauer edition which means it's loaded to the gills with features, and has cute little Christmas trees on its seats. You might prefer the less-well known XXIV Jack Bauer edition, which has guns instead of trees and always requires you to hot-wire it to start. Truth be told, the Eddie edition is pretty swank. 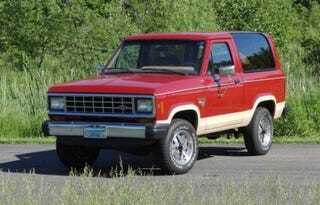 The Bronco II predated the wildly popular Explorer, but just like that SUV it could trace its roots back to the Ranger pickup. This one, like most, is powered by a 115-bhp version of the venerable Cologne V6. A year newer and it would have had a 100-cc larger edition of the same mill with fuel injection, which pumped over 140 ponies. Transmission duties are handled by an A4LD which is essentially a C3 with overdrive, and represented Ford's first attempt at an EEC-controlled lock-up torque convertor. A Dana 28 front axle holds up the nose here, while in back there's a Ford 7.5-inch. Everything on the truck looks to be in really nice shape, which is exceptional as the Bronco II rarely seems to be shown much love. These little Fords gained a reputation for being top heavy and - some say - suffering a flaw in suspension geometry that causes them to turn turtle at the most inopportune of times. This one seems to have been able to keep the shiny side up - and pretty damn shiny - for its 29 years so perhaps the issues were overblown, as such things often are. We'll have to decide if this Bronco II's price is equally overblown and we'll do that right now. What's your take on paying $13,700 for this tidy Bronco II with its Eddie Bauer accoutrements? Does that seem like a deal? Or, does that price make this a Bronco you would likely buck? Minneapolis Craigslist, or go here if the ad disappears. H/T to Vincent Davidson for the hookup!